No Man’s Sky is, without doubt, one of the most talked-about games at the moment, especially after (almost) stealing the show at the Playstation Experience Show (I say almost because Un-freaking-charted 4). With it’s procedural, well… everything and its endless gameplay value, it is a veritable and truly unique game. But what people often miss to take into account is the audio part of the game, the thing that nurtures and caresses all those eye-candy visuals and captivating mechanics – its soundtrack. Now, if you’re anything like me (and you probably are since you clicked on a title that had the word “amazing music” in it), you value a great soundtrack in a game and believe in the strong, but subtle impact that it has on that particular title. Some of the best games in the world had some of the best music scores as well. If you’ve ever played any title in the Heroes of Might and Magic (or as it is called now, Might and Magic Heroes), you’ll know what I’m rambling about. A game’s soundtrack (and this also applies to movies, plays, or any kind of entertainment act) is, in my opinion, one of the core elements on which that game is built upon. It’s the thing that holds it all together and gives it purpose, it helps the game make sense. And the most fascinating part of it is that you’re not necessarily aware of it. It changes the whole experience at an unconscious level of the mind, it affects your deepest psyche. Or it may simply be thrown in your face and blow you away, like when Skrillex came up in the Far Cry 3 drug field burning scene. And this looks like it could be one of the best qualities of No Man’s Sky. So, while everyone talks about its visual and gameplay aspects, I would like to dive into its music score. It all happened at this year’s E3 conference, where Hello Games presented a full trailer of the game. And as I watched and drooled over the laptop keyboard, I noticed halfway through the video that there something else that makes me love watching it – the music track. It had that certain fuzz about it, it completely fit in. I watched the whole thing over and over again just to listen to that magnificent track which helped build momentum through the whole video. So I hoped that it wasn’t something trailer-exclusive, I wanted that kind of music to be the game’s soundtrack, I craved the idea of flying through space while listening to it. It got me excited. I looked it up and started searching for that song in order to satisfy my curiosity and my ears. And so I’ve came upon 65daysofstatic, the band that was given the task to write the whole soundtrack of No Man’s Sky. It’s an English post-rock band composed of Paul Wolinski, Joe Shrewsbury, Rob Jones and Simon Wright. With five albums, nine singles and a live-album as well under its belt, the band is not a bunch of new-age hippies. Now, if you’re not familiar with post-rock, then I’ll simply put it as different. It’s usually without vocals which helps you focus on the feeling and atmosphere the song creates and it also incorporates all kind of sounds and textures into the songs which basically creates a limitless amount of elements to create. Sounds familiar? So not only that the type of music 65daysofstatic play resonates with the game itself, the developers have been huge fans since way before they started working on the game. But one of the most important aspects is that the musical style of the soundtrack will not be created for the game, but the game is built upon the feeling which the music evoques. So the developers already had that idea in their heads, the feeling which their game must emanate. They started from that particular thought, they knew exactly what they wanted and where they wanted to go. 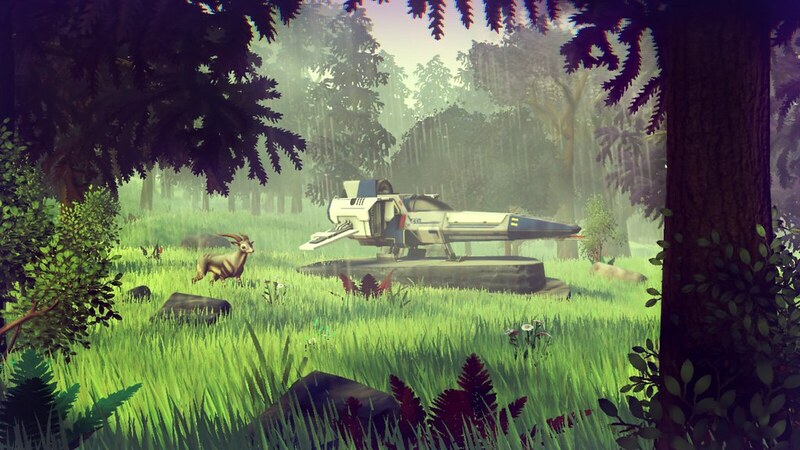 And with an industry filled with triple A games that violently fight for their identity, doomed to similarity and shallowness, No Man’s Sky will be a calm breath of fresh air. It knows where it belongs, it knows its purpose. And that purpose is letting its players chose their own. We’re in Las Vegas right now and played a new song, ‘Supermoon’ live at the The Game Awards, alongside new visuals which were created by Mr. Div, inspired by No Man’s Sky. We imagine this will be viewable online before too long. We’ve also been working with sound designer Paul Weir to help create further procedural sound for the recesses of No Man’s Sky’s lonely galaxy. So not only that No Man’s Sky will benefit from beautiful atmospheric music score exclusively composed by one of the best bands in the respective genre, it will also have unique and limitless sound effects for all those weird aliens (and not only) which players will surely stumble upon.